What is ITP’s business model? Founded in 1990, ITP is an independent software vendor (ISV). For 15 years, ITP has been focused exclusively on raising efficiency and quality of software maintenance and modernization. We focus on this because 80% of life cycle costs are spent after development is finished and 80% of IT labor costs are spent on Application Mining and Management. It makes no difference whether you have legacy, modern applications or a mix of both. Scanners and repositories have been in the marketplace for a long time. What is really new in ITP-PANORAMA? While all other Application Mining and Management vendors are still using relational databases for their repository, ITP has for ten years used OLAP HyperCube technology (known from Data Warehousing). Our very fast scanning allows daily updates of the repository. This scanning process includes the compilation of all programs. Your system will be analyzed and all inconsistencies will be shown immediately. We provide one toolset for all your heterogeneous IT systems. ITP-PANORAMA’s unique Data Flow Analysis allows following the value chain through your applications. Why is ITP-PANORAMA faster than any other tool? ITP is using OLAP HyperCube technology for its repository. The HyperCube is always “in memory”. (No disc access necessary) We can use up to 16 processors simultaneously in one search/analysis. 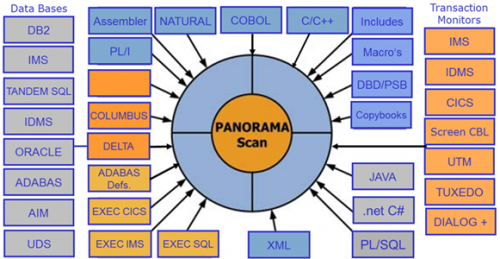 In which environment does the ITP-PANORAMA toolset run? Using Windows 2008 Server, our software can manage up to 100 million lines of source code. A multi-processor server can support hundreds of developers. How long does a developer need before they can work independently with ITP-PANORAMA? Two hours of learning by working with customer applications. How long does it take to scan in millions of lines of code? Makes reference checks across all applications. In one hour we are able to scan 15 million LOC COBOL, 10 million LOC PL/I or 6 million LOC JAVA. This allows daily updates of large IT systems. What is the procedure to learn more about ITP-PANORAMA? 4. Arrange for a 30 day trial. Discover things about your code that you previously never knew. What is included in the Proof of Concept? What is the procedure for a 30 day trial with ITP-PANORAMA? This will tell you a lot more about your software than you ever knew. What license model is ITP offering? How can we integrate PANORAMA with Rational Team Concert (RTC) and Rational Developers for Z (RDz)? FUJITSU has a competing software development environment under ECLIPSE by the name of INTERSTAGE. The analysis part of INTERSTAGE is our ITP-PANORAMA. FUJITSU has built a plug-in that works with RDz which has to be licensed. Can the tool detect any possibility of table/array processing that can exceed its limits or boundaries? For example, you have an array of 100 items but the program tries to manipulate data on the 101st item or beyond which causes storage overlay. Array indexing error: Determine the variables used for indexing the array. Select “Both” (means forward and backward). You will see all usages and also all changes of the index value. Now you can test whether the range is correct or not. Can the tool detect any possibility of eternal loop processing? For example, a Perform with UNTIL statement has a possibility that the UNTIL statement will never be satisfied. Select the variables in the UNTIL clause. Select “Both” (means forward and backward). You will see all usages and all changes of the index value. Now you can test whether the range is correct or not. Is the tool configurable to recognize application built I/O APIs instead of just the usual READ/WRITE/BROWSE statement? Some vendor products provide their own APIs for I/O so they’re not using the usual READ/WRITE/BROWSE statements. User written input/output programs act as “non-existing” programs. They are handled correctly with one restriction: Data Flow Analysis will not know that output operations do not modify the buffer (not a serious problem). To correct this, we assign a particular “Access Type” indicator (such as MQ*, IMS etc.). We can modify the scanner to support this (1-2 days of programming).